Firefighters respond to a fatal crash involving a big rig and multiple cars that shut down the 210 Freeway transition to the I-5 on Monday, Jan. 11, 2016. 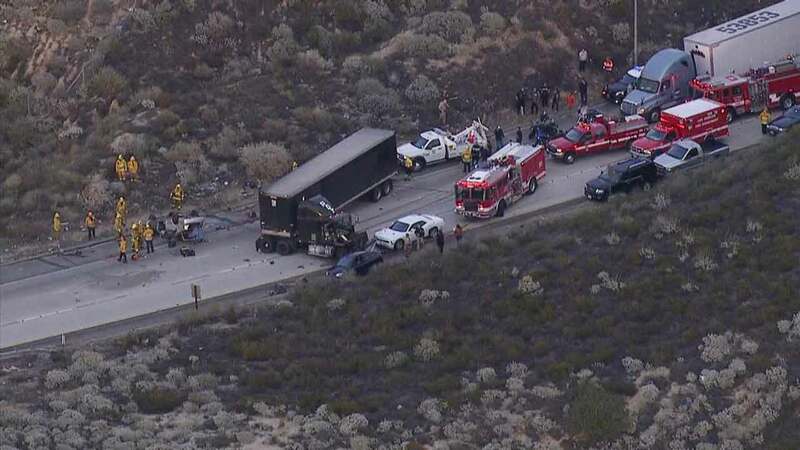 LOS ANGELES, California -- The son of a former Univision and Telemundo anchor was identified as the man killed in a crash involving a big rig on a freeway transition in Los Angeles on Monday. Pablo Gratas, 47, of Valencia, died at the scene of the crash that happened on the westbound 210 Freeway transition to the northbound 5 Freeway at 4 p.m.
Gratas is the son of Enrique Gratas, who was regarded as one of the most respected Spanish-speaking journalist. Enrique Gratas most recently anchored for Estrella TV in Los Angeles before he died from an illness on Oct. 8 at the age of 71. His son was driving a 2002 Toyota Camry when it collided with semi-truck, according to the California Highway Patrol. Two other cars were also involved in the crash. The driver of the big rig suffered minor injuries, and the other motorists were not injured. The CHP said drugs or alcohol are not believed to be a factor in the crash.